with this fun and talented design crew at the Pollock-Krasner house and property, a rural homestead from the 19th century at 830 Springs-Fireplace Road in Springs, East Hampton. I only live a block away from this beautiful, yet simple farm house and art studio in Springs, Long Island. For generations, the Springs area of East Hampton has had a special appeal and draw to artists and writers from all over the world. Springs is an off-the-beaten-path neighborhood of the Hamptons, and it has a more New England feel rather than the typical, manicured hedge-lined homes in East Hampton. With sleepy harbor views intertwined with marsh and pastoral scenes that seem to channel another era, Springs is a special place where the sea and land converge in a unique way. Many have boasted about the unusual light in Springs, which explains the lure of painters to the area. The Pollock Krasner House is the former home and art studio of Pollock himself as well as the renowned artist Lee Krasner. Over the years, I have visited often, but this summer, I had the opportunity to share my enthusiasm for this slice of American art history with a handful of designer friends when I led a two day-tour through the Hamptons on an antique and design exploration with my friend Toma Clark Haines of the Antiques Diva. As I planned the two day tour, visiting Jackson Pollock's Home was important to me since it explains a big piece of the East End's history for art and design. 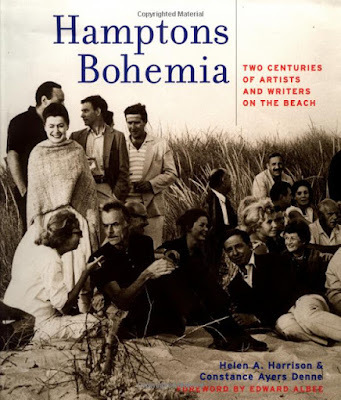 I was pleased to find out that the author of one of my most favorite books (Hamptons Bohemia) about the history of art in the Hamptons, also runs the Pollock Krasner home. Helen A. Harrison is passionate about art and this local community. Please note, Harrison's book is a fascinating read and archive of the long history of the bohemian culture of artists and writers in the area. Please read my story about Hamptons Bohemia. Jackson Pollock is best known for his infamous drip/pour paintings, which today are in the finest museums around the world. They are wonderfully colorful and layered, yet some are dark and chaotic, but at the time they were created, they challenged the world to think differently about art. I learned during the visit that Pollock's Drip Paintings were created from 1948-1962 when he experimented and painted this technique of pouring paint. On the floor of the studio today, you can see the original layers of drip paint melding together, it is truly a work of art itself. Guests must wear slippers upon entering the studio, but it incredible to stand above the beautiful melding of colors and design from another era. in the studio there are rare and original photographs of both Krasner, Pollock and their peers and work. Inside the house, it is fascinating to note the decoration and design of the bedrooms still in their original state (very chic). The museum offers a detailed audio tour, which took us back in time and room by room to hear the back-story of the personal and artistic life of this community in Springs. The tragic ending to Pollock's life and his legacy has permanently left its mark in Springs.